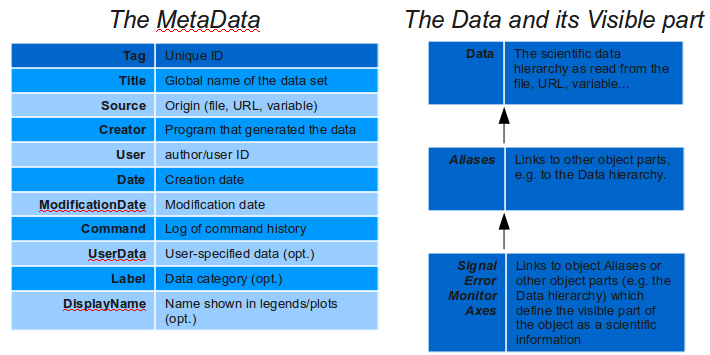 The iData class is a structure which holds some multidimensional data set (numerical blocks), as well as additional metadata and axes definitions, Signal, Error bars, Monitors, and user defined fields (aliases). 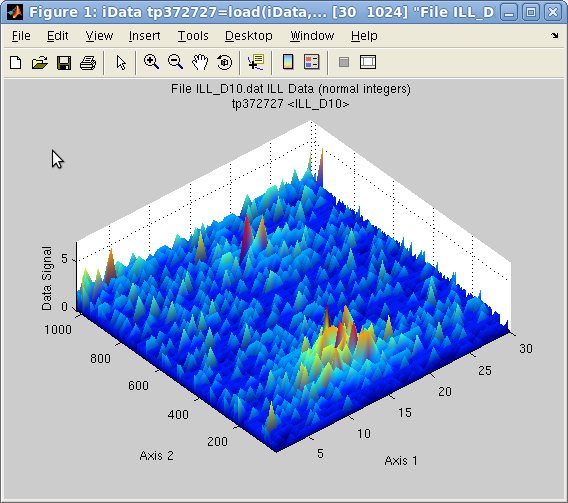 The instantiated objects, which are used as normal Matlab variables, often contain 1D, 2D, 3D, nD histograms or nD event lists. You will learn below how to customize these objects (set, get, setalias, getalias, setaxis, getaxis, indexing, ...). A large number of methods can be used with iData, including data import, plotting, saving, fitting and mathematical operators. For impatient readers, we advise you to refer to the quick Setting Signal and Axes documentation in the Load page, in order to customize the object. For the others, just go on reading how objects are built, and how to handle them. iData_Sab: a data set holding a liquid/powder/amorphous dynamic structure factor 2D S(alpha,beta) data set, used e.g. 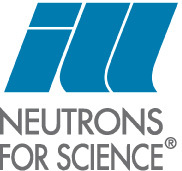 in nuclear data bases (ENDF, JEFF, ...). This class has about the same capabilities as the Sqw2D flavour, but in the (alpha,beta) frame. Some general information regarding the Source of the Data (origin, filename), Dates, Command History, User name and Creator. A unique ID, which can be complemented by an object Label (for instance the name of an experiment) and a Title (for instance the name of the sample). A Data field where all actual scientific data is stored, usually as a structure. Aliases, which may hold themselves data, or be defined as links to other parts of the object. A Signal, an Error bar and a Monitor which can either hold data, or point to other parts of the object. This defines the visible part of the object. A series of Axes, which are usually defined as links to Aliases or other Data parts. These Axes indicate how to interpret the Signal as a scientific data set. The iData object internal internal structure. In the following, we shall present how to manipulate iData objects, enrich them with additional information, define relations between the object parts as Aliases, define the object Signal and its associated Axes. Any object dimensionality can be handled. A more limited support exists for event based data sets. The main idea here is that iData objects can be handled the same way as structures and Matlab Graphics Objects using get and set methods. showing the object unique ID, its dimensions, title, the last command which produced the object, and an optional label (here empty). The same output is given by the display(a) command. This latter display indicates the definition of the Signal, Aliases and Axes (if any - see below). The object 'data' is stored in the 'Data' field of the object structure. This is usually were any file is imported. Field names are case insensitive, that is b.title will also work. Accessing subfields requires a case sensitive name match, that is a a(3).data works (single field accessed), but a(3).data.varia.a1 does not (requires fully qualified path to the data). The get function can also apply with iData arrays, as shown above, and then returns cell arrays. It is also possible to plot the object, and we direct the reader to the Plotting page. The set assignment may also be used with arrays of iData objects. We shall see below that there is a way to extend an iData object, that is add some new information, and to create links within the object. The Title of an object usually stores the origin and type of the data (filename). In addition, an object Label can be defined to e.g. sort objects with user defined names, such as 'Measurement1',',Background', ... in the spirit of Labels (Mac OSX) and Emblems (Linux/Gnome) in window managers to provide customized colours and/or icons. These can be searched using the findfield, and findstr methods, see above, or findobj(iData,'Label','TAS'). An Alias in iData objects correspond to user fields, dynamically created and evaluated. The previously seen UserData field of the iData structure is static. One can indeed store something there, but there is only one such slot. We shall see that not only we can create new fields to hold some information, but also that these Aliases can point onto other aliases or parts of the iData object. The main methods used to assign and extract Alias definitions are setalias and getalias respectively. We shall see below that the set and get methods can also be used, but only apply on the Alias values (which is usually a numerical one). The mechanism seen here works for numerical fields, but will fail if you decide to store structures and cell arrays into an Alias. Then, we recommend to define a new member in the Data part of the object, and then point to it as a link, as explained below. Alias names are case insensitive, that is a.newfield will also work. The alias labels are used as axis labels when plotting objects. which makes it so that NewField is de-facto QH. Links which can not be evaluated are returned as is, that is as character strings. As explained below, it is possible to define links to othet links, or external files. The AnotherNewField points to NewField, which was defined as Data.ZEROS.A1. Advanced Alias definition may be set by means of the 'this' self-referring symbol which can be used within full expressions. 'this' then refers to the object itself. In this last example, we have changed the NewField definition, which immediately affects AnotherNewField (defined above). The links are evaluated dynamically, so that their value follow the target one. In the case the link begins with file://, ftp://, http://, or https:// the external resource is accessed when requesting the alias value, and its full content is retrieved as a structure using iLoad. The external link may optionally end with an anchor specification #keyword, and the matching elements in the external file are then selected and returned. The file is accessed for each alias value request. In the previous examples, the QH Alias has been defined from the import routine, and it is assigned a static array (you can see that by looking at the get(a) output). We see here that the get method follows definitions recursively until a numeric value is found. The getalias returns the current Alias definition, but does not propagate to other potential links. >> a.AnotherNewField = 4			% this stores 4 in the NewField alias ! The direct structure-like assignment and set method propagate the assignment value to the fully qualified link. The direct structure-like reference and get method propagate the fully qualified link in order to actually find its value. whereas the similar set command removes the final target PNT but leaves the NewField Alias pointing to nothing. Re-defining PNT will, at the same time, re-enable NewField. That's why we strongly recommend to use setalias when you wish to control an Alias immediate definition, and set when you want to control its final value. The setalias can also define the Alias as a static numerical value, as seen previously, without risking to affect deeper object parts. Similarly, a call to getalias will reveal the nature of the Alias, as link or numerical value. An other example would be to define QH as a column of a matrix. Changing its value, or the one of any further Alias pointing on it will effectively modify the column in the matrix itself. In a few words, the set/get functions work just as the linking mechanism in Linux/Unix systems with the ln command. The set function always defines the final value of a field, and we shall see that it may sometimes follow a series of definitions in the case of Aliases. The a.field=value syntax is equivalent to set(a,field,value). The Signal is a special Alias that points to a numerical block which is the relevant data to handle for plotting or computing (see mathematical operations). Setting the axis 0 with a value first multiplies it by the Monitor, and then sets the Signal. In case you want to ignore the Monitor weighting, simply assign the Signal directly. The Signal label can be inquired or set with the usual setalias and label methods seen in the Alias section. This label is shown on plots along the Signal axis (e.g. Y on 1D plots and Z on 2D plots). We point out that the object can be assigned a global Title and Label as well. The title is shown as the plot title and the object text display (see Inquiring the iData object). creates a new iData object with a subscript Signal (and relevant axes definitions - see below). The dimensionality of the iData object is the one from its Signal. It is obtained from the ndims method and the length of each dimension is obtained with the size method. In principle, there is no limitation concerning the size of the Data and Signal, and the dimensionality (except memory restrictions). The following table indicates the different types of Signal that the iData can handle, and the associated requirements regarding Axes. In principle, no axis is needed here. n Axes are required, each may have a dimensionality from 1 to n, with preference for vectors. n Axes are required, each being a scalar or vector of same length as Signal. NOTE: Not all Math methods support this type of data, and it should be converted, when appropriate, into nD grid histogramed with the hist or interp operators (see Math/interpolation). The first dimension refers to rows, the second to columns, the third to pages, and so on. The Signal is attached to an Error bar, which represents an uncertainty on a Signal value. The Error bar is considered to be symmetric w.r.t. each Signal value. This Error propagates along most mathematical operators and is also used for proper weighting of optimization methods when performing model fit using e.g. a least-square criteria. No error bar mechanism is currently implemented for axes and aliases. The Error defaults to sqrt(Signal) when not set (that is a.Error=). A constant Error can be set, an expression (including using Data or this) or any numerical value that matches the Signal size. Similarly, a Monitor is attached to the Signal. It represents e.g. a counting time or any statistical weight w=1/Monitor that is to be taken into account when performing mathematical operations such as combine and most binary operators (+-/*) involving normalization between signals. In these cases, the Signal and Error are divided by the Monitor prior to performing the operation, and multiplied back after operation. The Monitor defaults to 1 when not set (that is a.Monitor=). A constant Monitor can be set, an expression (including using Data or this) or any numerical value that matches the Signal size. The Signal, Error and Monitor fields of an iData object are protected Aliases: they can not be deleted. Axes are defined just as Aliases. They are used for Math operations and plotting. Axes are indexed from 1 up to the Signal dimensionality, that is a vector Signal has one axis, a matrix has 2 axes, a volumetric signal has 3. The 1st axis relates to the number of rows, the 2nd axis to the number of columns, the 3rd axis to the depth, and so on. The axis index then is associated to the mathematical definition of indexes in a matrix/tensor. However, the 'X', 'Y' convention is the one used in standard Matlab 2D/3D plots such as surf and mesh. This corresponds to the logical axes when looking at a matrix from above with horizontal axis referring to columns and vertical to rows, starting from the lower left corner. NOTE: As a result, the axis of rank 1 is usually labelled as 'Y' (on rows, that is vertical for a matrix seen from above), and the axis of rank 2 is labelled as 'X' (on columns, that is horizontal) except for 1D objects where this is the rank 1.
where the first command returns the 1st axis values, and the second commands returns its definition, which may be a link to a Data part. In principle, the axis rank should be within 1 up to the object dimensionality. Upon request, any undefined axis is automatically created when it matches the Signal dimensionality. In case a new Axis is defined with a numerical value (scalar, vector, matrix, ...), an Alias is automatically created, and the Axis then points to it. WARNING: when assigning an axis, in the case it has been previously defined as a link, the target of the link is assigned (refer to the relevant Alias section for more information). Most iData methods apply on both single objects and arrays of objects. In many cases, with input arrays, the result is given back as cell arrays or iData arrays. This vectorization is suited to the iterative handling of large amounts of data sets. The zeros method initializes an empty (or constant) array of objects. The squeeze method acts just like the usual Matlab squeeze one, and removes singleton dimensions in multi-dimensional arrays. This is useful when working with e.g. cat, dog, and array subscripts such as a(1,:,:). Other operators, such as fliplr and flipud, or a simple indexing of the objects as for usual arrays, can be used to manipulate the data sets. Refer to the Math page for more information about slicing, cutting, appending and merging. where x,y,z,... are the coordinates, and sx,sy,sz,... are signal values (for instance a magnetic field vector at given location in space). 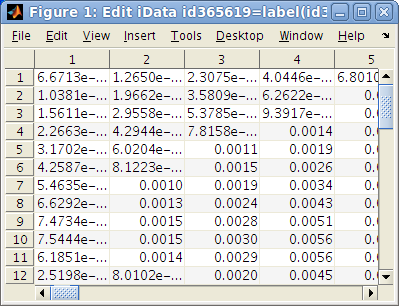 On import, these data sets result in a matrix which rows are events, and columns are the coordinate/values, as above. It is possible to format the data set into a formal event list, using the 'event' method after loading. The 'event' method can either make a guess on the dimensionality of space and signal, or specify the number of columns which are affected to the coordinates x,y,z,... (dimensionality of space), and the columns which is to be used for the 'signal'. When more that one 'signal' column is given, the norm of the given columns, per event, is used. Event data sets can further be converted into histograms using the 'hist' or 'meshgrid' methods. The histograms can be prettified using the 'fill' method, which makes sure that empty spaces in the histogram are interpolated with neighboring values. More information available in the Math page. We shall present in particular a few additional methods of general use that may be useful. commandhistory(a): return the list of all operations required to obtain an object, from initial import. When no output argument is specified, a list dialog shows this history, which can be saved as a Matlab script for further re-use. imroi(a): interactively select a region of interest (ROI) in a 1D-2D-3D data set.